This simple printing method is fun, easy, and won’t make a big mess, so it’s perfect for crafters of all ages. Ready to get started? 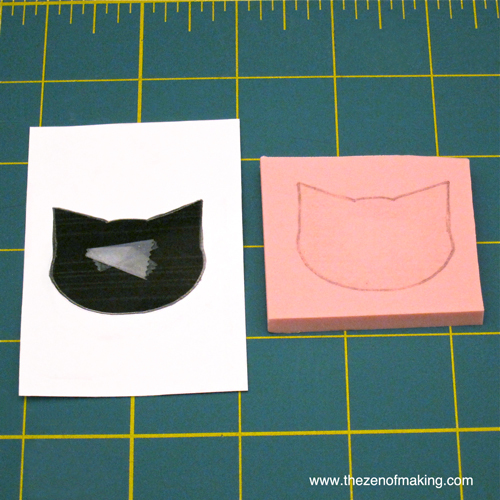 My free downloadable cat pattern template will make carving your block a snap! 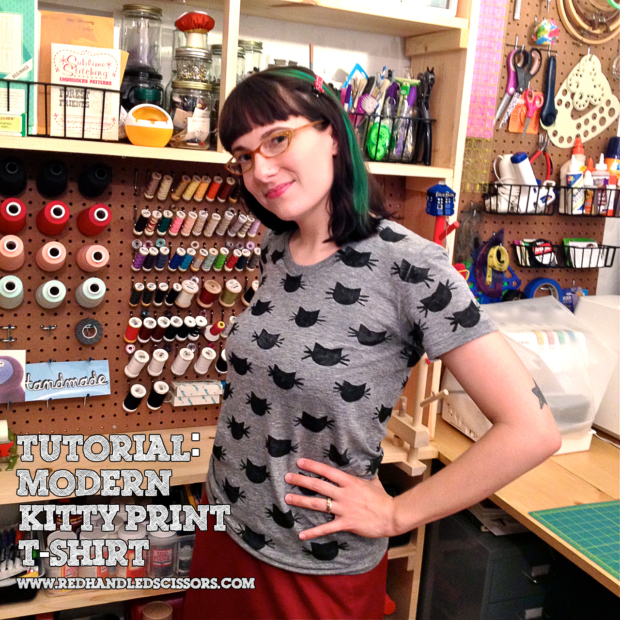 Print the cat pattern template PDF and trim away the excess paper from around the shape. 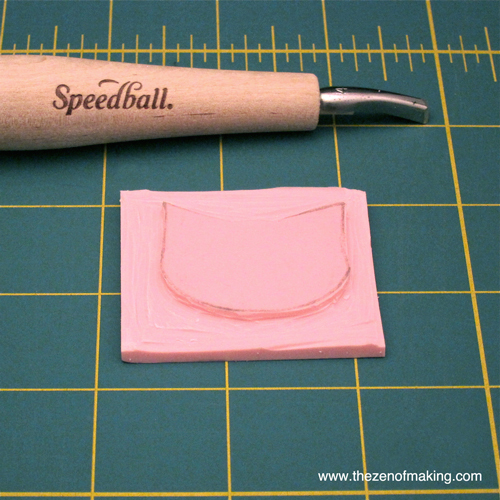 Next, use a craft knife to cut a piece of Speedy-Carve block that’s slightly larger than the template. 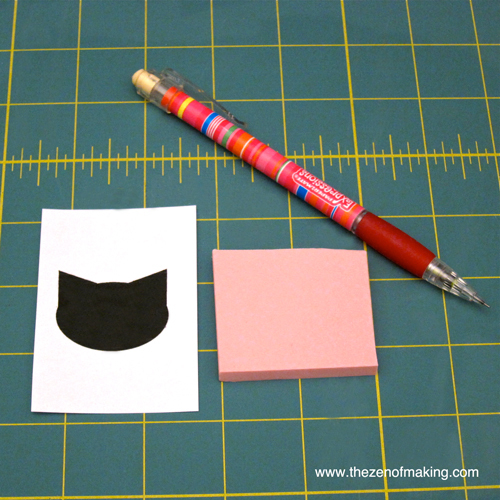 Use a pencil to carefully trace a line around the outer edge of the shape. Go over this line several times to ensure that the marks are dark enough to make a good transfer. Use a piece of scotch tape to attach the template (face down) to the carving block, then rub your thumbnail gently over the marks you made in step 2 to transfer the pattern to the block. 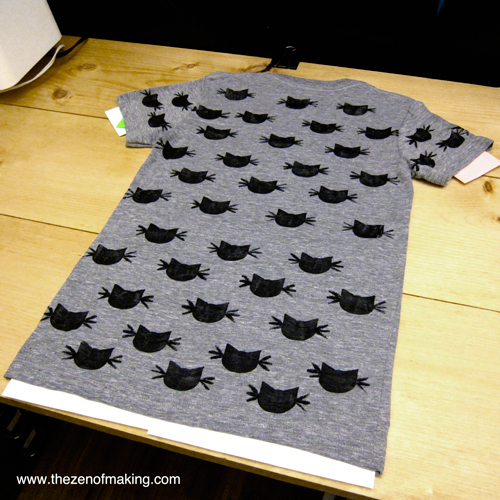 Before printing on your t-shirt, make sure you test the stamp on a scrap piece of fabric to ensure that you’re happy with the shape. 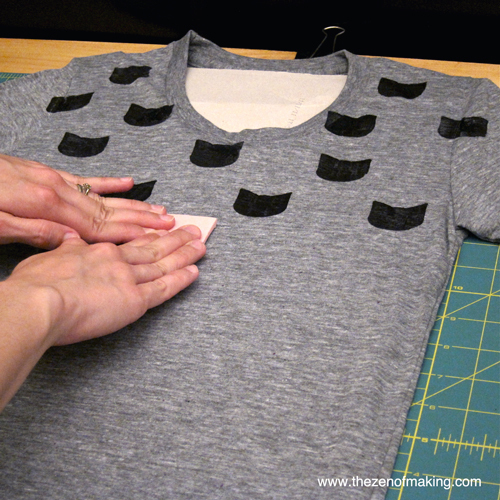 Press your t-shirt if needed, then use a large quilter’s ruler and a water soluble fabric marker to mark the places where you will stamp the pattern. I wanted my stamps to line up diagonally, so I created an offset grid with 4″ between each stamp in a row, and 2″ between each row.  Once your shirt is marked, you’re ready to start printing. 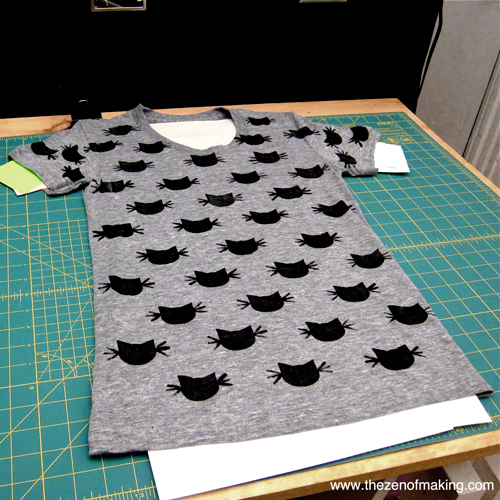 Place a layer of cardboard or scrap paper between the fabric layers of the t-shirt to prevent the ink from bleeding through, then use a sponge brush to apply a thin layer of fabric paint to the raised cat shape on the block. 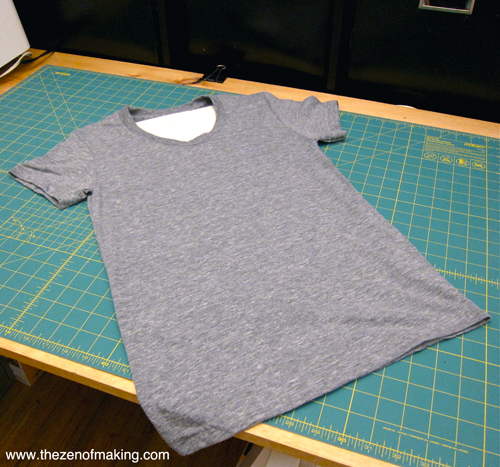 To print, center the inked stamp on the first mark (from step 5) in the upper left hand corner of the shirt. Press the stamp down firmly on the fabric to transfer the paint, then lift it straight up to avoid smearing. 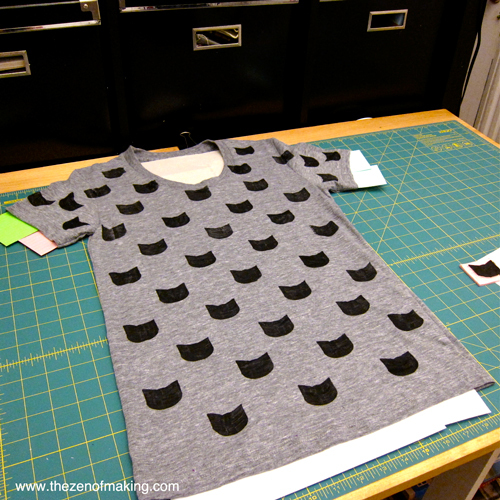 Continue printing cat shapes in horizontal rows from top to bottom, reapplying the fabric paint between each stamp. Tip: If you’re having trouble getting a complete shape, press the block down firmly, then rock the stamp very gently from front to back and left to right before lifting. 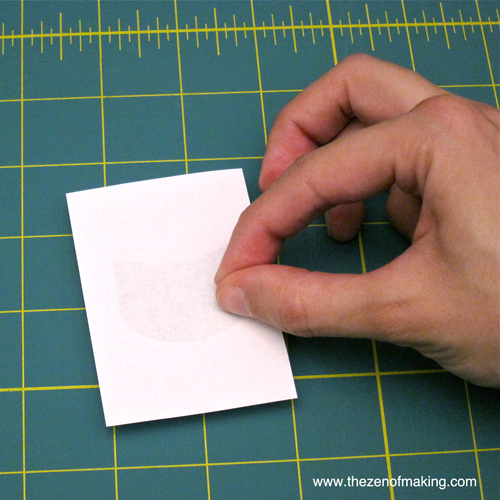 Be careful not to move the stamp during this process, or your shape will come out smudged or distorted. 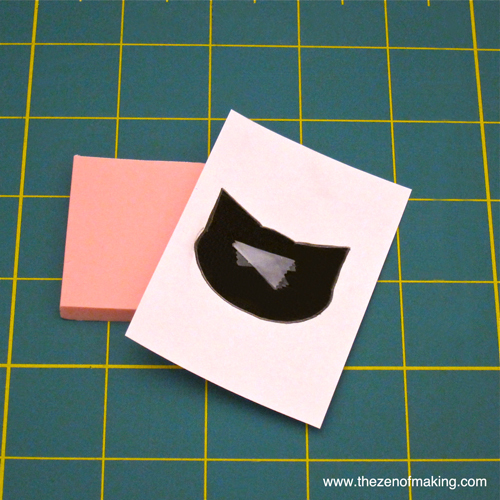 To add whiskers, you’ll use the tapered tip of the sponge brush as a stamp. 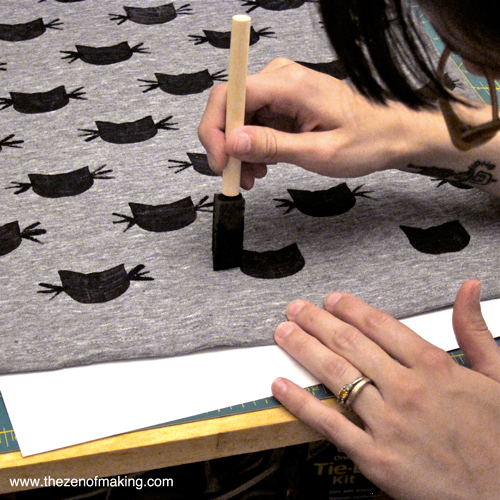 To do this, lightly dip the tip of the brush in fabric paint, then press the tip down gently onto the fabric, creating three horizontal lines on both sides of each cat-shaped print. 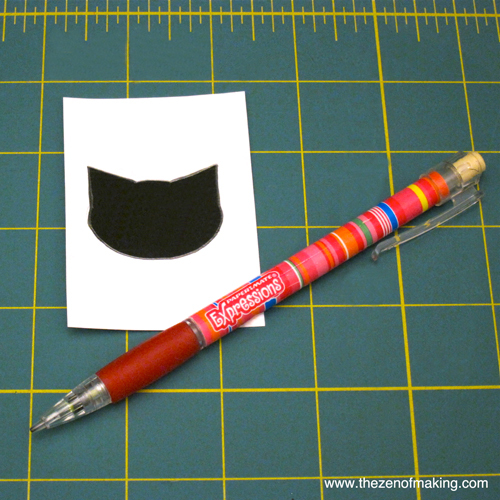 Tip: Practice making whiskers on a scrap piece of fabric until you get a feel for the proper thickness and placement. 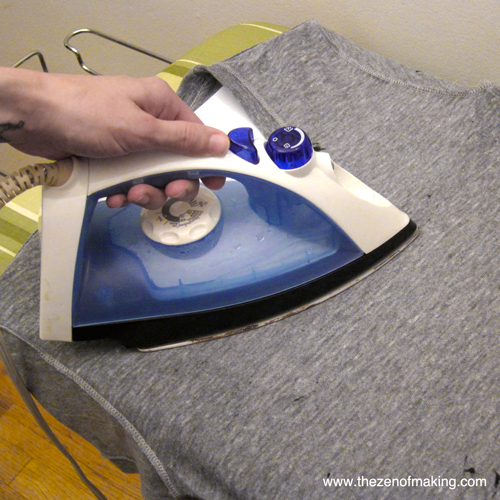 When the paint on the front of the t-shirt has dried completely, repeat the printing process on the back side. 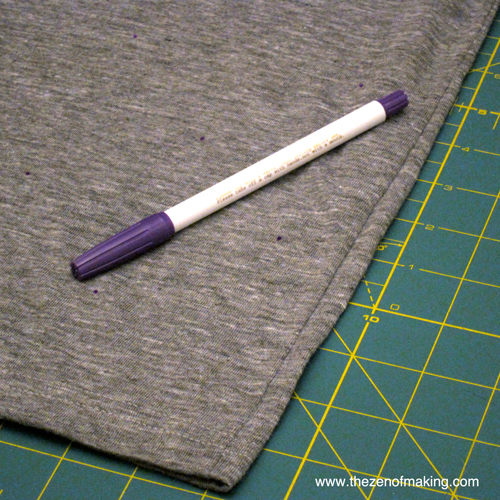 If you’re using a fabric paint that requires heat setting, turn the t-shirt inside out and place scrap papers between the layers of fabric, then press according to the instructions on the paint package. This might be my favorite project to date! Now that we’ve done kitties, what other patterns would you like to see? Wonderful tutorial, thank for sharing !!! I love the idea! might have to make one with birds! Wow! This is so cute and fun. Thank you for sharing. Great tute! You are so talented!! Eeep! I like it a lot! Thanks! I love your “frugal floral cat lady” description! I love the owls idea! Wonder if that would take more than one stamp..
Really cute! Just curious, why did you not include the whiskers on the stamp rather than adding them after the fact? Hi, Dot! Thanks for asking about the whiskers–I meant to add that to my original post. My first version of the stamp had whiskers carved on it, but the thin lines made it pretty easy for the paint to blur or smudge if the stamp wasn’t placed perfectly. Making the whiskers after the fact was the best way I found to get crisp fine lines. This was great thanks! But I faced couple of issues while trying to do it. 1. I failed to get an even coating on the stamp. My paint has a funny texture when I apply it on Tshirt. I tried applying with a roller and it didn’t help either. 1. Did you wash your shirt before applying paint? Some fabrics/garments have starches or coatings on them from production, and that can interact with paints. 2. This may sound silly, but did you shake or stir the paint to make sure it was well-mixed? The texture can be a bit off if the paint isn’t completely combined. 3. 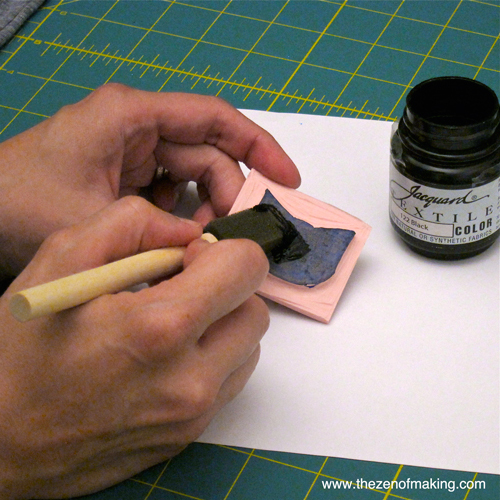 Are you using a sponge brush to apply the paint to the stamp? For me, this step was key for getting good, even printing results. Thanks again, love the site! Thanks, Yasmine. Other animals/shapes would definitely look great too–I’d love to see what you come up with! Pingback: Cross Stitch Hand Stamped T-Shirt!